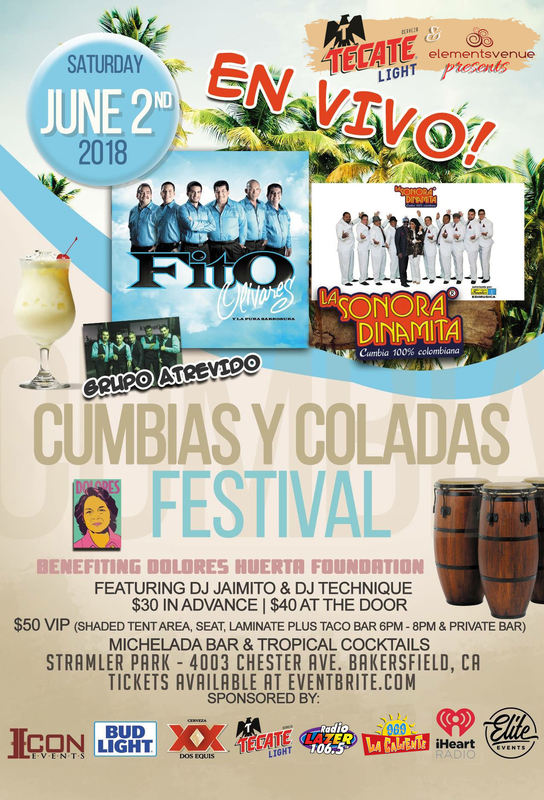 Elements Venue presents Fito Olivares, Sonora Dinamita w/Vilma Diaz, Grupo Atrevido, DJ’s Technique & Jaimito. A Portion of the Proceeds to Benefit The Dolores Huerta Foundation. VIP $50.00 Doors @ 4pm – [Includes: Shaded Tent Area, Laminate, Taco Bar 6pm-8pm, Private Bar, Mariachi & DJ]. Rock & Wings, Asada Grill & Elements Venue will provide Catering. Elote Man, Churros, Shaved Ice, Funnel Cakes, Fruta Stand, Shrimp Cocktails & Much More!!! Lawn Chairs & Blankets are Permitted, NO OUTSIDE FOOD, ICE CHEST OR BEVERAGES!!! This event is for ages 21 and over. Please be prepared to show ID. For more information, please call 661-301-4681.